4. Evaluation of a Blue Ocean Strategy - A Purple Ocean? Nintendo, the Japanese video game console manufacturing company, is one of the big players in the respective industry along with Sony and Microsoft. In 2006, when the competitors were following the industry norm to improve the product features, Nintendo followed a disruptive route to target a new market with a new product that none of the competitors had: the Wii. The following report strives to present a comprehensive strategic analysis of Nintendo for the executive board. 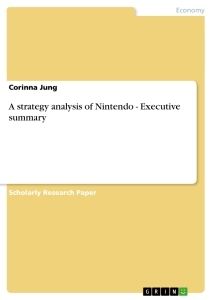 Beginning with an analysis of Nintendo’s current strategy, the report evaluates the strategy in terms of its fit with the environment. Finally, the report presents some recommendations and implementation issues that the board needs to consider while making its decision. The strategic analysis of Nintendo has been conducted at the corporate level along with the Blue Ocean Strategy that played a key role in the formulation of its disruptive strategy. At the corporate level, Nintendo is following an Innovation Strategy that has played an important role in building its competitive advantage. Figure 1 shows an analysis of Nintendo’s innovation strategy through the framework of the Innovation Dilemma (Johnson et al., 2008). The analysis of Nintendo’s innovation strategy indicates that it used an innovative business model i.e. to position itself completely different from its competitors andquestioned how people actually want to play through its in depth customer understanding (Pontiskoski and Asakawa, 2009). Secondly, Nintendo used a technological push i.e. to target an untapped or incomplete market of gamers, as it had to convince the non-gamer adult to play on a Nintendo platform. Through its largest advertising campaign in its history, with costs over $200 million (Sliwinski, 2006), the company offered family-friendly and easy-to-use motion sensor technology.Thirdly, product innovation i.e. introduction of the Wii-mote and an infrared pointer was regarded as innovative product design (Farhoomand, 2009). Microsoft and Sony have now copied motion-detecting technologies for their respective consoles, namely the Microsoft Kinect and Playstation Move. Hence, it is arguable that Nintendo has set a trend for the video game market, a dominant design that its competitors are willing to follow. Concerning inimitability the motion based family oriented concept of gaming is copyable. However, according to Nintendo,the followers will not have the same innovative impact as the Wii had back in 2006. Nintendo has already acquired a lot of prior learning from its path dependency and acquiredsubstantial experience regarding this technology (BBC, 2009). Analysing the strategy of Nintendo in terms of Ansoff’s strategic choices (1968), Nintendo has followed a diversification strategy by introducing a new product, the Wii through its innovation process in order target a new market of casual gamers and families. However, after having introduced a new product, it was soon imitated by competitors. Nintendo therefore tried to develop its new market by introducing the Wii fit in 2007 (Farhoomand, 2009) that combined features of health and gaming in the same console. The Business level strategy is concerned with how to get advantage over competitors (Johnson et al., 1999). Nintendo followed a Blue Ocean Strategy (BOS) by avoiding the competition from the industry and targeting the non-gamers segment. By offering the Wii Nintendo created a new market or a blue ocean. We could argue that this was an emergent strategy for Nintendo as the company had been hardly hit by Sony’s success which led Nintendo to sense a consumer trend emerging in the gaming industry i.e. the gamers market was shrinking due to a lack of time and high difficulty levels of games(Watts, 2009).Therefore, in order to survive in the industry, Nintendo had to come up with a product that none of its competitors provided. It used this trend and customer understanding to conduct a BOS. Figure 4 shows the method through which Nintendo implemented its BOS (Nintendo, 2011). Analysis of William Wordsworth's "London, 1802"